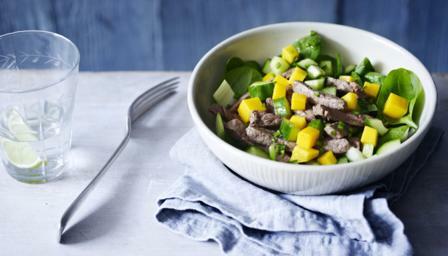 This delicious beef salad is healthy and quick to prepare - perfect for a midweek supper. For the sweet and tangy dressing, mix together the light soy sauce, lemon juice, orange juice, groundnut oil, caster sugar and honey in a small bowl. Whisk well to combine, then add the cucumber and chilli. Stir and set aside. For the beef, heat a wok until smoking and add the groundnut oil, then add the beef and stir fry for a few seconds. Add the rice wine or sherry and cook for one minute. Add the crushed dried chilli flakes, light soy sauce and pinch of ground white pepper. Cook for 1-2 minutes, or until the beef is cooked to your liking. To serve, scatter the spinach and sliced pak choi over a serving plate and spoon the chilli beef into the middle. Drizzle over the sweet and tangy dressing, sprinkle over the finely diced mangoes and serve immediately.